This is just a reminder that the Addlestone Library and the Charleston Tibetan Society cordially invite you to watch the construction of a Tibetan sand mandala. Here is an updated schedule of events associated with the sand mandala. Details: Addlestone Library will be hosting the Charleston Tibetan Society as they construct a sand mandala, an ancient, sacred form of Tibetan Buddhist art, in the Addlestone Library rotunda. Venerable Lobsang Tsering from the Drepung Loseling Monastery Center for Tibetan Buddhist Studies, Practice, and Culture in Atlanta, Georgia, will be constructing a mandala devoted to Chenrezig, the Tibetan name for Avalokiteshvara, the Bodhisattva of Compassion. This particular mandala illustrates, in two dimensions, the divine palace, residence, or celestial abode of Chenrezig. The finished mandala will be approximately four feet in diameter and will take a week or so to complete. There are several events associated with the sand mandala. Listed below are the dates for the opening and closing ceremonies and the daily hours Venerable Tsering will be working on the mandala. Venerable Lobsang Tsering and Geshe Dakpa Topgyal will consecrate the site of the mandala with approximately 30 minutes of chanting and mantra recitation. Immediately following Venerable Lobsang Tsering will begin to draw the lines for the design of the mandala on the table. Additionally the Division of Marketing and Communications will be doing a time lapse recording of the mandala for The College Today news site. 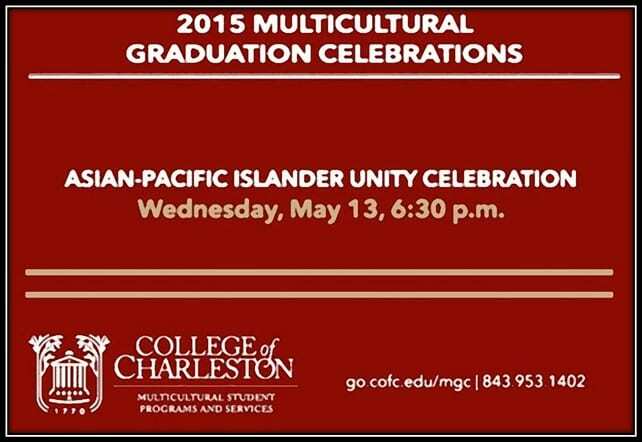 Tonight is the 1st annual Asian-Pacific Islander Unity Celebration. The API Unity Celebration is a culturally-focused event that celebrates and recognizes the achievements of our graduating Asian, Pacific Islander, Indian, Arabic, and South Asian American communities on campus. Graduating students, including undergraduates and graduates, are invited to take part in the celebration, which occurs each academic spring term; the days prior to college-wide commencement events. This year we have three (3) special 2015 Asian-Pacific Unity graduates: Aimi Nguyen, Andrea Nillas & Monica Patel. Please join us tonight! Please feel free to drop by the North Campus Wednesday May 6 at 9:30 AM, for the dedication of ourLittle Free Library. The Library was built and donated by Charleston resident Fred Herrmann, and School of Education, Health and Human Performance professor Tracey Hunter-Doniger helped Memminger Elementary 6thgrade students design and paint it in the style of artist Jonathan Green. The two lead student artists will attend the dedication. Professor Carl Wise’s article “Eclipsed Autonomy: Celestial Images and the Free Will Debate in Antonio Mira de Amescua’s Álvaro de Luna Plays” was published in the latest issue [66.2 (2014): 109-122] of the Bulletin of the Comediantes. At the annual Kentucky Foreign Languages Conference on April 23-25 at the University of Kentucky, four Hispanic Studies faculty members collaborated. Professors Susan Divine, Michael Gómez and Sabrina Laroussi presented their studies respectively: “Transforming the Narrative: Isaac Rosa, Historiography, City Space, and Live Tweeting Democracy,” “Playing with Time: Relativistic Reverberations and Entropic Echoes in Lorca’s Así que pasen cinco años” and “Entre lo fantástico y lo extraño: Un estudio narcorreligioso de María llena eres de gracia.” Dr. Mark P. Del Mastro also attended to conduct the 13th Annual Sigma Delta Pi Informative Session.